The Sony a7R is an ideal camera for infrared conversion. 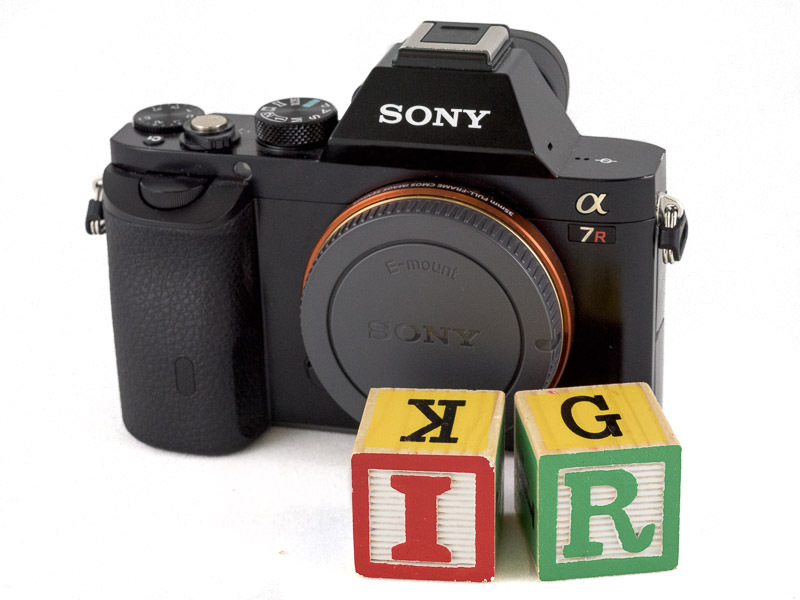 Unlike DSLRs, which require IR Auto Focus (AF) calibration for each lens and/or focal length, mirrorless cameras (full frame, MFT, or APS-C) need no AF calibration, and focus IR accurately via the imaging sensor. That means all of my Sony FE lenses are potential candidates for IR photography. More on lens selection later. With an EVF and Live View providing a WYSIWYG preview of the scene being photographed, composition, focus and exposure with the a7R are straightforward. Allows more color to pass and is especially suited for color IR photography with great saturation and color range. Black & white also looks quite good although with a bit less contrast without adjustments. Keep in mind that the image captured is of reflected light not visible to the human eye. 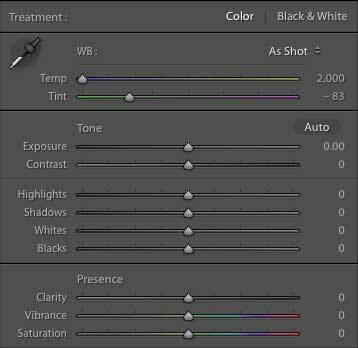 Adding color, either by White Balance (WB) or Channel Mixer adjustments in Adobe Lightroom or Photoshop produces a “false color” image. False color images are usually surreal, often with white or orange foliage and dark blue skies. Another popular post-processing option is conversion to black and white, resulting in monochrome images unique to IR photography. 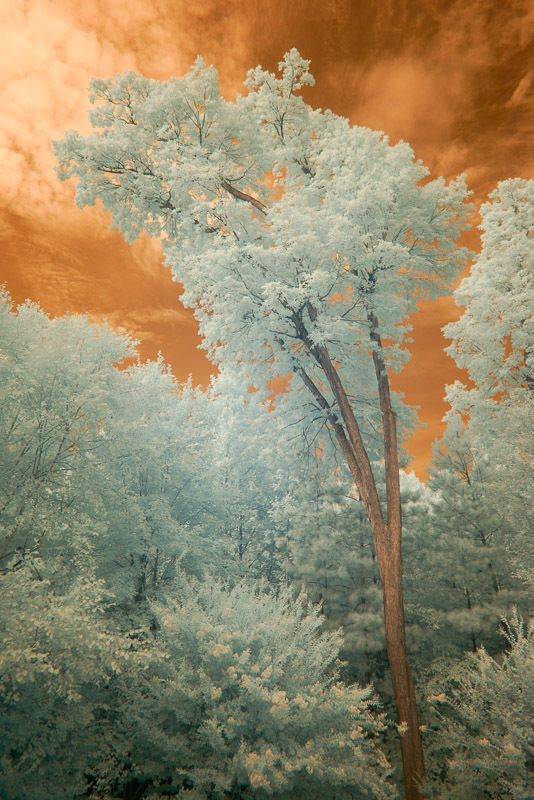 Image capture using the IR converted camera is straightforward and very similar to normal shooting. I shoot RAW, using Multi (matrix) metering, Aperture Priority, and Auto ISO. The in-camera White Balance (WB) setting serves only one purpose – to render a visually useful image on the rear LCD or through the EVF for purposes of composition, focus, exposure verification and image review. Auto WB doesn’t work with the converted camera because it’s designed for the visible spectrum. Fortunately, LifePixel supplies a custom WB (2700K) with the conversion, resulting in an EVF/rear LCD false color view that serves its purpose well. Focus Peaking is of limited use on the IR converted camera, but Auto Focus (AF) and Manual Focus (MF) with Auto Magnification work fine with either the EVF or Live View. While Exposure Bias is likely camera-specific and always subject-specific, I’ve found that a setting of +1.0EV gives me a better starting point than 0EV. Lens selection requires some care and experimentation. Some lenses will produce a hot spot, or an area in the image (usually in the center) that is brighter than the rest of the image. Hot spots are lens-specific and are to be avoided. Like lens flare, fixing an image in post-processing is not an option. For the a7R, the FE 24-70mm f/4 (my “go to” lens for general use), FE 55mm f/1.8 and FE 70-200mm f/4 lenses work well, but the FE 35mm f/1.4 lens has given me hot spot problems. LifePixel and Kolari Vision maintain lists of lenses that are prone to hot spots. No waiting for the golden hour. No waiting for overcast skies. Bright sunny days – OK. Contrasty midday light – no problem. Brilliant blue sky with some clouds – excellent. In other words, IR photography breaks all of the conventional rules regarding best times to shoot. When other photographers have retreated to grab lunch or wait for sunset, the best opportunities for IR take place. Lush green foliage renders white or yellow. Blue skies appear dark, as if a polarizer were used, with clouds adding dimensionality. My subjects are usually landscapes, so I can’t opine on the suitability of IR for photographing people, wildlife or architecture (yet). Try it and see for yourself. 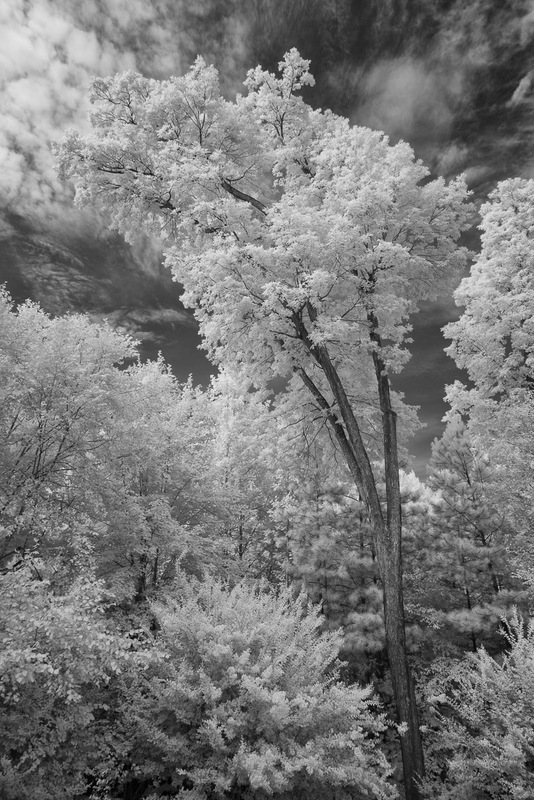 Post-processing an infrared image presents a variety of creative choices that are beyond the scope of this article. I’ve provided links to several excellent tutorials on post-processing at the end of this post. I’ll outline my post-processing steps, with examples of what to expect along the way. The starting point is the RAW IR image imported from the camera, with no adjustments or profiles applied. The first step that I take in post-processing is the creation of a Camera Calibration profile for LR or Adobe Camera Raw (ACR). This is a “once and done” step, and the profile can be applied to all of your IR images. The profile is necessary because the WB of the captured image doesn’t give enough adjustment “room”, with the Temp and Tint sliders pegged to the left extreme. Rather than detailing the process, I recommend watching Jason Odell’s excellent video on creating and using a Camera Calibration profile for LR and ACR. After taking this step, and applying the profile, there’s more latitude for adjustment of both WB Temp and Tint. And the image begins to show promise. At this point, before working on false color or black & white conversion, I apply my normal LR/ACR settings and presets – lens profile correction, deconvolution sharpening (pre-sharpening), and noise reduction (if necessary). Green Channel: Red=0%, Green=100%, Blue=0%. And I add Hue/Saturation, Curves and Levels adjustment layers to adjust the false color, increase the contrast, and adjust the white and black points. I have incorporated those three steps into a Photoshop action that you can download here. Rather than quitting at this point, I recommend experimenting with various post-processing techniques, including filters, plugins and black & white conversion. I prefer the Nik (Google) Silver Efex Pro plugin for black & white conversion. 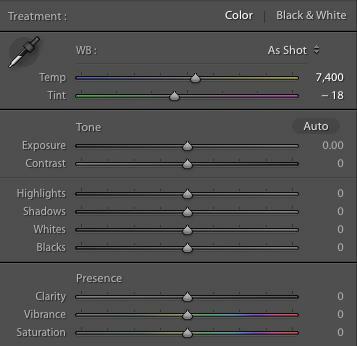 In Bob Vishneski’s article “How to Process Infrared Photographs”, he suggests alternatively changing the Silver Efex Pro black & white layer Blend Mode to Luminosity. I like the added drama that results. I’ve only touched the surface with respect to post-processing alternatives. But I have summarized the steps I usually take to get to a result that I’m pleased with. As the saying goes, “your mileage may vary”. Experimentation is the key. Infrared photography using the Sony a7R has proven to be a fun, educational and artistic journey. And while I’ve taken the path of having a full-frame 35mm 36MP mirrorless camera converted to a specific spectrum choice (665nm), many other IR options are available. Compact point-and-shoot, DSLR, and mirrorless cameras are all candidates for IR conversion, to capture full-spectrum (requiring external filters to isolate infrared) or specific IR spectrum cutoffs. Find a little-used camera on your gear shelf or a bargain online and start the journey. Here’s a link to my Infrared gallery. Adobe, Adobe Lightroom and Photoshop are either registered trademarks or trademarks of Adobe Systems Incorporated in the United States and/or other countries. Google, Nik and Silver Efex Pro are either registered trademarks or trademarks of Google in the United States and/or other countries. This entry was posted in Uncategorized and tagged a7R, Actions, Infrared, Photography, Sony, Yates Mill.